Be the first to share your favorite memory, photo or story of Elisha. This memorial page is dedicated for family, friends and future generations to celebrate the life of their loved one. 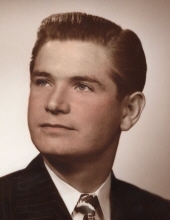 Elisha Burnell “Tom” Abbott, 93, of Danville, Va., passed away on Tuesday, November 27, 2018, at Roman Eagle Rehab and Healthcare Center. He was born February 24, 1925, in Danville to the late Tiller Sigmon Abbott and the late Elisha Johnson Abbott. He was also preceded in death by his wife, Marion Whitlow Abbott. Mr. Abbott proudly served his country with the US Army. He was a decorated WWII veteran, who was wounded in combat and was also a P.O.W. Prior to his retirement, Mr. Abbott was the owner and operator of Danville Electric Company, Inc. He is survived by his daughters, Paula A. Bobbitt and husband Tim, of Providence, N.C., and Debra A. Ketchum of Luray, Va.; his sister, Dovie “Bootsie” Ferrell of Danville; his grandsons, John Ketchum, Stephen Abbott, and David Michael Gunnell; and his great-grandchildren, Chloe, Sophie, Paige and Dexter. In addition to his wife and parents, Mr. Abbott was predeceased by his daughter, Susan Renee Abbott Gunnell; his grandson, Paul Ketchum; his sisters, Mary Frances Fleming and Doris Abbott Tilghman; and his brothers, Billy Abbott, Bobby Abbott, Curtis Abbott, and Raymond Abbott. Funeral services will be held at 11 a.m. Saturday, December 1, 2018, at Norris Mt. Hermon Chapel with Pastor Richard Berkley officiating. Interment will follow at Leasburg Community Cemetery, Leasburg, North Carolina. The family will receive friends from 6 p.m. to 7 p.m. Friday, November 30, 2018, at Norris Mt. Hermon Chapel. Norris Funeral Services, Inc. and Crematory, Mt. Hermon Chapel, 3995 Franklin Turnpike, Danville is serving the Abbott family. Online condolences may be made at www.norrisfuneral.com. To send flowers or a remembrance gift to the family of Elisha Burnell "Tom" Abbott, please visit our Tribute Store. "Email Address" would like to share the life celebration of Elisha Burnell "Tom" Abbott. Click on the "link" to go to share a favorite memory or leave a condolence message for the family.